HOLLYWOOD, Calif. – Called “incredibly entertaining” (Daniel Eagan, Film Journal International) and filled with “non-stop action from start to finish” (Emily Engberg, ABC-TV, KSTP), director Michael Bay’s TRANSFORMERS: THE LAST KNIGHT explodes on 4K Ultra HD, Blu-ray, and Blu-ray 3D Combo Packs September 26, 2017 from Paramount Home Media Distribution. The groundbreaking adventure will also be available as part of the TRANSFORMERS’ 5-MOVIE BLU-RAY COLLECTION arriving September 26. The film arrives two weeks early on Digital HD September 12. TRANSFORMERS: THE LAST KNIGHT shatters the core myths of the TRANSFORMERS franchise, and redefines what it means to be a hero. Humans and TRANSFORMERS are at war, OPTIMUS PRIME is gone. The key to saving our future lies buried in the secrets of the past, in the hidden history of TRANSFORMERS on Earth. Saving our world falls upon the shoulders of an unlikely alliance: Cade Yeager (Mark Wahlberg); BUMBLEBEE; an English Lord (Sir Anthony Hopkins); and an Oxford Professor (Laura Haddock). There comes a moment in everyone’s life when we are called upon to make a difference. InTRANSFORMERS: THE LAST KNIGHT, the hunted will become heroes. Heroes will become villains. Only one world will survive: theirs, or ours. The latest installment in the global TRANSFORMERS franchise stars Mark Wahlberg (The Fighter) and features a sensational supporting cast including Josh Duhamel (Transformers), Stanley Tucci (The Hunger Games), Anthony Hopkins (“Westworld”), Isabela Moner (“100 Things to Do Before High School”), Laura Haddock (Guardians of the Galaxy), Santiago Caberera (“Salvation”), and Jerrod Carmichael (“The Carmichael Show”). 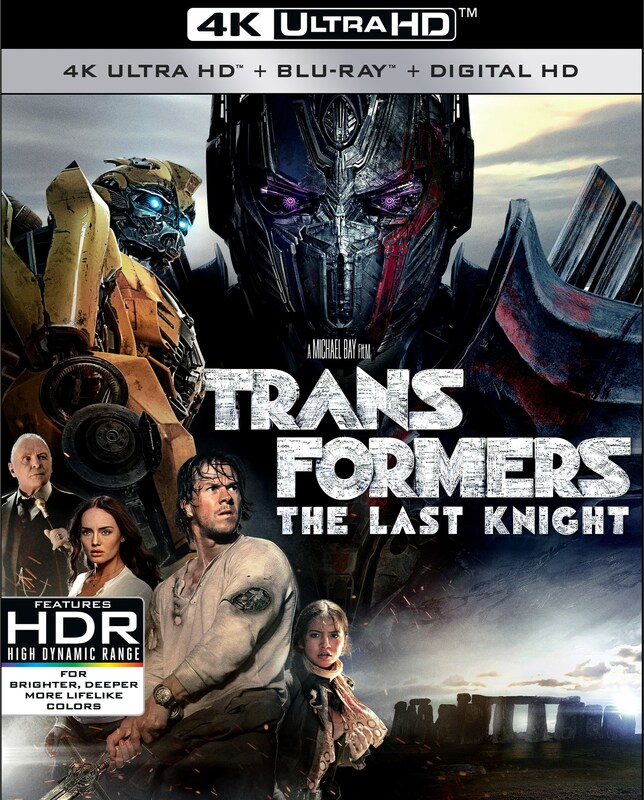 The TRANSFORMERS: THE LAST KNIGHT 4K Ultra HD, Blu-ray, and Blu-ray 3D Combo Packs include a bonus disc with over 80 minutes of behind-the-scenes content and interviews. Travel to Cybertron to explore the TRANSFORMERS home world, then visit the UK to delve into the locations used to bring the epic adventure to life. In addition, go inside the secret mythology of the legendary robots in disguise, check out the incredible vehicles used in the film and much, much more. 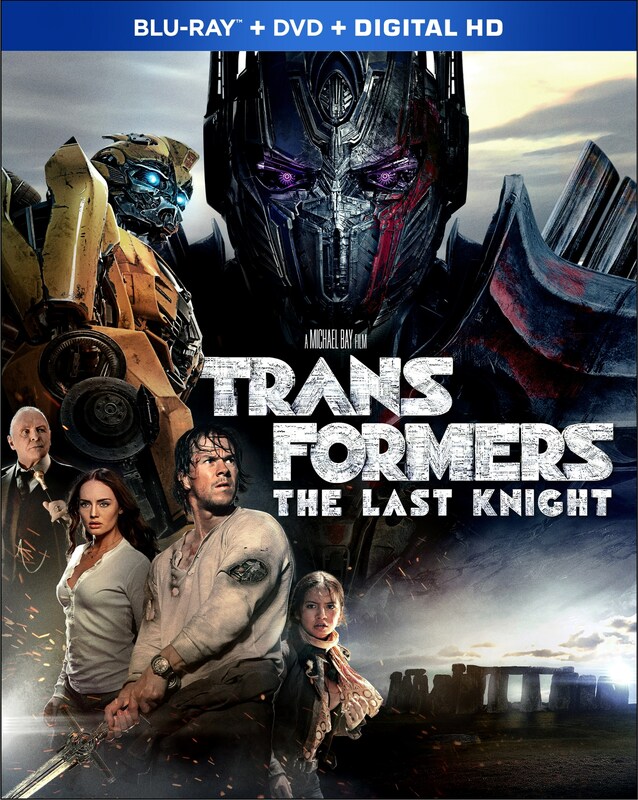 TRANSFORMERS: THE LAST KNIGHT is Paramount Home Media’s first 4K Ultra HD release in Dolby Vision™, which enhances the home viewing experience by delivering greater brightness and contrast, as well as a fuller palette of rich colors. The film also boasts a Dolby Atmos® soundtrack* remixed specifically for the home theater environment to place and move audio anywhere in the room, including overhead. Fans can enjoy the ultimate viewing experience with the 4K Ultra HD Combo Pack, which includes the two Blu-ray Discs detailed above, as well as an Ultra HD Disc presented in 4K Ultra HD with English Dolby Atmos (Dolby TrueHD compatible), English 5.1 Discrete Dolby Digital, English 2.0 Discrete Dolby Digital, French 5.1 Dolby Digital, Spanish 5.1 Dolby Digital, Portuguese 5.1 Dolby Digital and English Audio Description with English, English SDH, French, Spanish and Portuguese subtitles. The Combo Pack also includes access to a Digital HD copy of the film. The Blu-ray 3D Combo Pack includes the two Blu-ray Discs detailed above, as well as a Blu-ray 3D presented in 1080p high definition with English Dolby Atmos (Dolby TrueHD compatible), English 5.1 Discrete Dolby Digital, English 2.0 Discrete Dolby Digital, French 5.1 Dolby Digital, Spanish 5.1 Dolby Digital, Portuguese 5.1 Dolby Digital and English Audio Description with English, English SDH, French, Spanish and Portuguese subtitles. The Combo Pack also includes access to a Digital HD copy of the film. The single-disc DVD is presented in widescreen enhanced for 16:9 TVs with English 5.1 Dolby Digital, English 2.0 Discrete Dolby Digital, French 5.1 Dolby Digital, Spanish 5.1 Dolby Digital and English Audio Description and English, French, Spanish and Portuguese subtitles. The disc includes the film in standard definition and access to a Digital HD copy of the film. TRANSFORMERS: THE LAST KNIGHT will also be available in a 5-movie Blu-ray Collection that includes TRANSFORMERS, TRANSFORMERS: REVENGE OF THE FALLEN, TRANSFORMERS: DARK OF THE MOON and TRANSFORMERS: AGE OF EXTINCTION, as well as the bonus Blu-ray Disc detailed above and access to Digital HD copies of all five movies. Dolby Atmos delivers moving audio – sound that can be precisely placed and moved anywhere in three-dimensional space, including overhead. It brings entertainment alive all around the audience in a powerfully immersive and emotive experience. To learn more about Dolby Atmos, visit www.dolby.com/Atmos. * To experience Dolby Atmos at home, a Dolby Atmos enabled AV receiver and additional speakers are required, or a Dolby Atmos enabled sound bar; however, Dolby Atmos soundtracks are also fully backward compatible with traditional audio configurations and legacy home entertainment equipment.